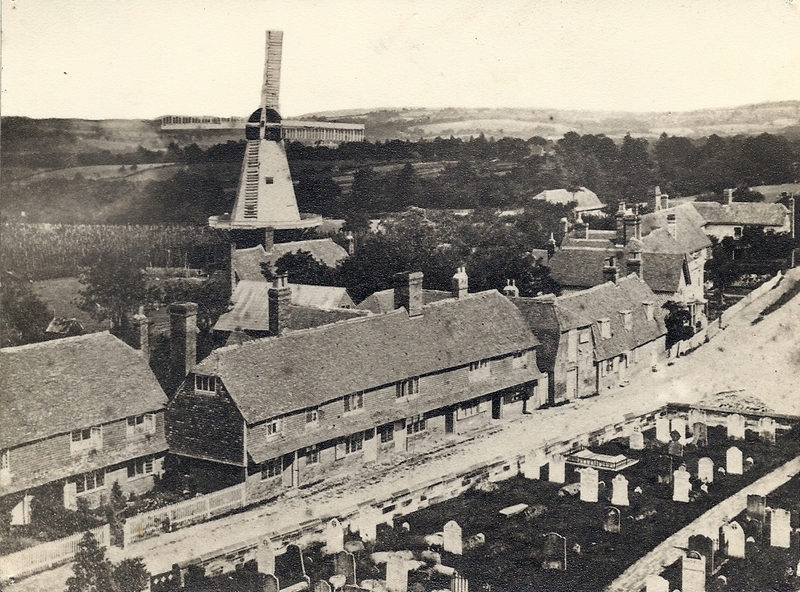 Sometimes known as Town Mill, Goudhurst windmill stood behind Weavers’ Cottages in Church Road. It towered above the cottages and from the top the view of the surrounding countryside was said to be better than the view from St Mary’s Church tower. The entrance to the mill was between Mill House and Mill Cottages. Goudhurst windmill was a Smock Mill. It was a white weatherboard structure on a brick base with a black cap on top where the sweeps, or sails, were fitted. As with the Tower Mill, only the cap on the Smock Mill needed to be turned to the direction of the wind and so make the sweeps turn and drive the shaft. The shaft turned the cogs that turned the millstones. I won’t go into the detailed workings of a windmill, suffice it to say that, in this case, the shaft was made of metal, not wood. Our archives show that at one time there was a pig pound below the windmill. It is recorded that ..“a lad’s hat blew off while he was descending from the windmill one day and it landed in the pig pound“. Needless to say, the hat was in a real mess! It is also recorded that there were cattle grazing below the mill. How things change! Goudhurst mill was built in 1803 for a man named Jeremiah Birch. It was constructed by a local reputable millwright by the name of Mr James Humphrey who had his shop and house in Cranbrook where the School Lodge is now. He went on to build windmills at Hythe and Sheerness, and he also built the 70ft high mill which still stands in Cranbrook today, a testament to his skill. As you can imagine, building a windmill was not without risk to the workmen. During the construction of Goudhurst mill there was a terrible accident. A young apprentice to Mr Humphrey, a lad from Pevensey in his early 20s, fell and broke both legs, both thighs and both arms. We don’t know have any details of his name, how he fell, nor of what happened to him after the accident. The mill was working for over 70 years and during that time there was a series of millers. In more prosperous times a bakery business was also carried on at the mill. According to old business directories, Henry Allen held the mill until 1839 then John Pope from 1840. However, the tithe map of 1842 shows Henry Allen as the miller and Douglas Moodie as the owner. The land is described as “a hop garden, house and garden, mill, mead and yard“. We believe that Douglas Moodie was the son-in-law of James Humphrey, having married Mr Humphrey’s daughter, Ann in 1830. He was a successful draper with premises in Week Street, Maidstone. Douglas died in 1847 and the mill and land passed to his widow Ann. The 1841 census shows Henry Allen as the miller with John Pope. Only John Pope appears on a census in 1851 when he is shown as employing 2 men. Dates are overlapping so we can only say that Henry Allen was at the mill until some time between 1839 and 1851. The mill was sold by auction in Maidstone in January 1852. The purchaser was John Miles. In around 1853 John Pope and John Miles formed a partnership. John Miles borrowed £800.00 from William Burgess that year as a mortgage on the mill and land. John Pope is listed in the business directory of 1858 so he was still there then. However, things seem to have gone wrong for them because the partnership was dissolved in 1860. The mill then came into the hands of one Joseph Norrington. Joseph first appears on the census in 1861. He worked the mill first by himself and then with his son until about 1875. Both father and son are on the1871 census and Joseph, the son, is shown as a miller and baker. The 1871 and 1874 business directories both show Joseph Norrington as the miller. Finally, a Mr Thompson was the last miller. He worked the mill for about 2 years. But, business was declining and the mill became derelict and unsafe. The 1881 census shows the mill as “empty“. Another miller mentioned in the records is Alfred Coleman. It is recorded that he worked the mill for several years but no dates are given. When the mill fell into disuse it was purchased by Mr Haskett Smith. He had the sweeps removed and a lead roof and railings fitted around the top of the mill to “preserve a most admirable viewpoint, superior in some aspects to the Church Tower”. After it was closed down, the mill was purchased for demolition by Messrs W Arnold & Sons of Bartley Mill in Frant. It was finally pulled down and dismantled in 1890. The method of raising the mill was quite simple – A wire rope was placed round the structure and fixed to an engine. The engine pulled until the mill fell over. The crash when it fell was apparently heard all over the village. 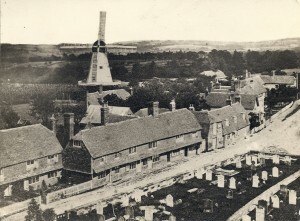 Unfortunately, only one photograph of the mill survives and that shows it standing behind Weavers Cottages. The earliest record found of a windmill in Kilndown is a 21 year lease granted to a John Barber dated 1st June 1661. He was granted the tenancy of a small cottage and some ground in Kilndown in order to the “attending of and looking to an ancient wind corn mill” standing nearby. The mill is also shown on Ogilby’s 1690 London to Rye road map and on Seller’s map of Kent 1710. However, neither map shows the exact position of the windmill. An inventory of a Stephen Barber, miller and late of Goudhurst, dated 10th September 1709 shows the mill had still been in use with “flower, bushels of wheat and oates, a corn bin and mill-stones” listed there. Stephen Barber could well have been the son of John Barber and maybe he took over the mill on the death of his father. No further record is found of a windmill in Kilndown after Seller’s map of 1710. But, it is now widely believed that the windmill in the Ashdown Forest at Nutley originally came from Kilndown. It is thought the windmill was transported to Nutley some time around 1817. There was no mill recorded on the site at Nutley before 1820.